The unusually warm waters and a plentitude of plankton may have enticed the endangered species to return ahead of time. Downtown Provincetown is still in winter’s hush, but an annual rite of spring has already begun. The North Atlantic right whale, among the world’s rarest mammals, has returned to Provincetown waters weeks ahead of schedule and in stunning numbers, likely drawn by the unusually warm waters after a historically mild winter. “All of nature is ahead of itself,’’ said Michael Moore, senior research specialist at the Woods Hole Oceanographic Institution. 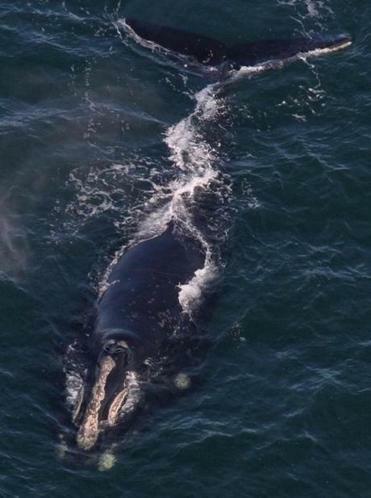 There are only about 475 North Atlantic right whales left in the world, and many gather each spring in the rich feeding grounds of Cape Cod Bay, drawing crowds of onlookers with their acrobatic breaches. But this winter, researchers first spotted the enormous creatures in mid-December, and have since identified almost three dozen more. With each new sighting, some within 300 yards of shore, scientists have grown more amazed. Mayo said he had never seen “so many whales so early,’’ but said pinpointing the precise cause is difficult. The likely enticement, however, is high levels of plankton researchers have found in the bay, tiny marine organisms that right whales swallow up like giant vacuum cleaners. The whales, which tend to travel in loose-knit groups, are known to visit areas where they have previously found ample food supplies. There may be a relationship between higher water temperatures and increased plankton levels, but Mayo said the evidence is not definitive. Cynthia Tynan, who directs the center’s Right Whale Population Program, said it will be important to study how the early influx of whales relates to other ecological conditions. The early arrival of the whales, reported yesterday in the Cape Cod Times, could be linked to the record number of dolphins found stranded on Cape Cod beaches in recent weeks. Water temperatures this winter have been more than 3 degrees above average, a dramatic change that could have far-reaching effects on the bay’s ecosystem. Right whales, which earned their name because they were the “right’’ type of whale to pursue and were hunted to near-extinction, primarily live in the Gulf of Maine, although some travel as far south as Florida. Hunting right whales has been banned since the 1930s, but the population remains highly threatened by ship collisions and entanglements with fishing gear. Just last week, a marine team with the Provincetown center freed a right whale that had a fishing line looped over its head and through its mouth. Almost three-quarters of right whales have scars from ship strikes and previous entanglements, researchers say. Last April, state regulators urged vessel operators in the Cape Cod Bay to reduce speed and post lookouts to avoid collisions. Vessels are prohibited from approaching within 500 yards of a right whale. Adult right whales are about 50 feet long and can weigh up to 70 tons. Mayo said he had thought the whales would have moved on by now because of cyclical changes to their food source. So far they have proven him wrong, as they are wont to do. Whether they stay put for their typical spring sojourn, he said, remains to be seen. “It’s going to be fascinating,’’ he said.